Two decades have passed since the transition to democracy began in Eastern Europe. Today, West and East-Central European countries share a common political space - the European Union. This has created a fascinating opportunity for analysis of the similarities and differences between these countries. Here, VÃ­t HlouÅ¡ek and LubomÃ­r Kopecek critically apply the party-families approach to political parties in the Czech Republic, Hungary, Poland, Slovakia, and Slovenia. With chapters devoted to social democrats, greens, the far right and left amongst many others, this book charts the parties' origins, ideologies, and international ties alongside their Western European counterparts. 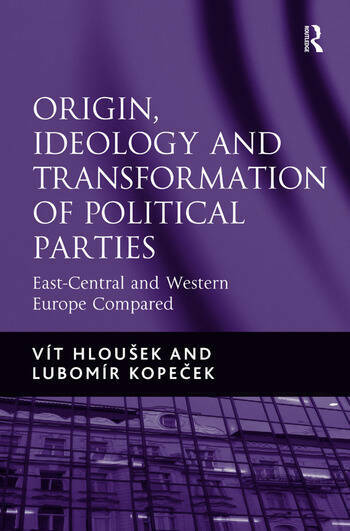 By examining the political relevance of different party families, HlouÅ¡ek and Kopecek are able to assess the validity of this typology in the analysis of the transformation of political parties in this region. Detailed analysis coupled with an innovative application of the party families approach, makes this essential reading for students of party politics.